Miami Movers – Miami is a huge city and moving in the area can be difficult. Our experienced professionals will make your move hassle free. With fifteen plus years in the county area, Discount South Florida Movers will move your belongings safely and timely to their destination. We guarantee that you will be happy with your moving experience and with our low rates. In order to provide you with the best service, we have supervisors on site for every move. Our professionals can do every part of the moving process including securely packing your belongings. It doesn’t matter if it’s your home or office. We can meet all of your moving needs day and night, weekends too. Miami is the seat of Dade county and is classified as an Alpha-World City by the World Cities Study Group. 400,000 people live in the city with over 5 million living in the metropolitan area. The city has the distinction of being the richest city in America as well as the cleanest major city according to Forbes. The economy of the city revolves around its powerhouse financial district. It has the largest concentration of internal banks in the United States. Port is the busiest in the world for both passenger traffic and cruise lines. It’s known as the “Cruise Capital of the World”. Rounding out the economy are its large research institutes and a thriving biotechnology industry. 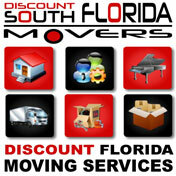 Discount South Florida and Miami movers provide low rates on residential, commercial, piano and long distance moving.